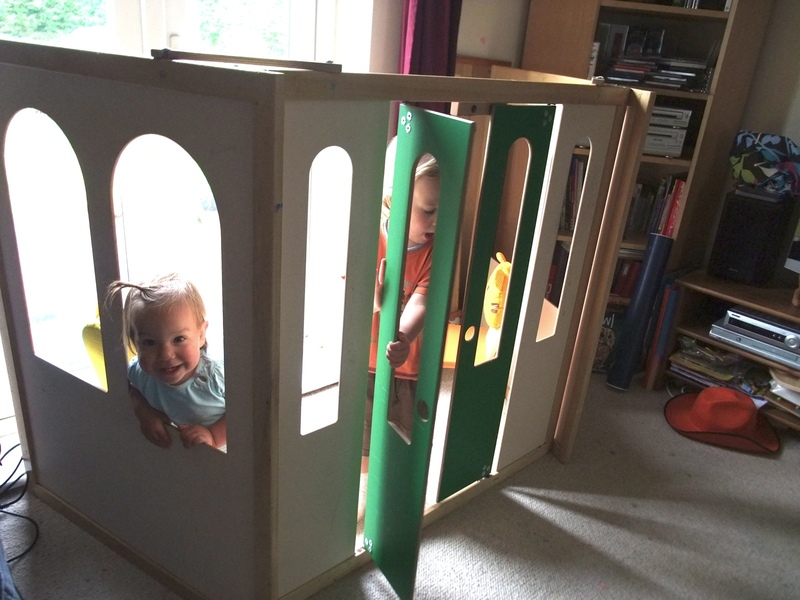 Way way back in the Summer I found this amazing playhouse in a skip. Being a bit of a scavenger I carried it home (I think the excitement of a bargain might have raised my adrenalin as it is pretty heavy). The girls loved it and it has been happily located outside under the gazebo for the summer, and then into the shed for the Autumn. We resurrected it for the winter since we don't use the French windows when it is so cold and wet and it has been taking up rather a lot of room in our lounge since. 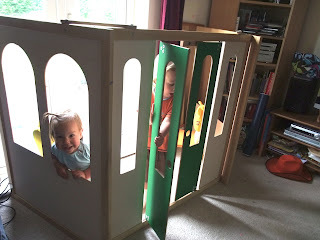 I wanted something a bit more exciting for the girls to do in there than just sit around, and being skint I didn't want to buy a nice kids kitchen for them so I have had my eyes open for more skip goods. 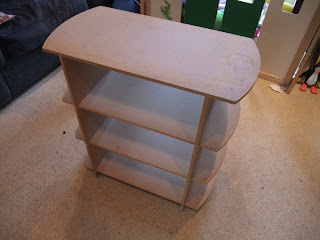 I found this shelving unit by the side of the road and for ages it has been just sitting in the house, happily played with by the girls but while they were away this weekend I decided to get down and sort it out. So here's the new kitchen. 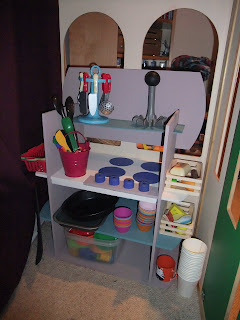 The unit slotted together really easily, so it was simple to change the layout, and I just added a little shelf at the top. 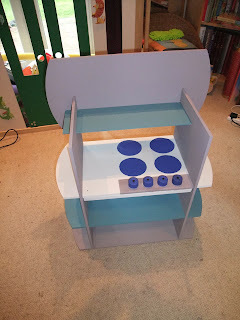 I'd been collecting Calpol lids for this purpose and just screwed them in lightly to give oven knobs. I usually use tester pots of paint for this sort of thing, but I had some leftover paint from decorating our house and from my parents so there was plenty. Here it is in situ. The girls love it!